Paneer or cottage cheese is a must have in several Indian homes. It is protein rich and is an essential ingredient used in cooking a variety of dishes like Mutter paneer, Malai kofta, Palak paneer, rasgulla, etc. 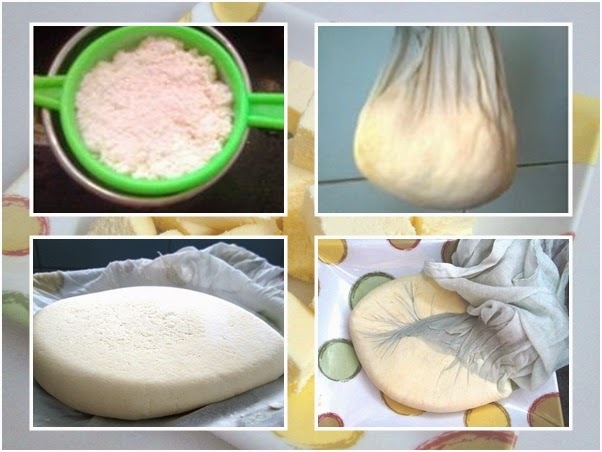 This cheese (paneer) can be easily prepared at home. For making paneer, boil milk in a pan, and add 1 tbsp of vinegar (alternately, you can use lime juice), salt to taste and stir well for a few minutes. The milk would have separated from the whey by now. Switch off the gas and close a lid and leave aside for about half an hour. Then drain out the water and pass it through a sieve so that most of the water is drained. Now transfer it to the centre of a muslin cloth. Hold it as shown in the figure and squeeze through to remove the excess water. Then take a plate, invert it and place the muslin cloth over it. Open and press with fingertips to form a square as shown. Then cover from all sides. Invert another plate on top of it. Hold the sandwiched plates on your hand and place it along the wall over the sink and press well with your hands to remove all the water. Water will ooze out from between the plates. Once all the water has been drained, leave the sandwiched plates aside for about 1 hour with a weight on top. Remove the weight and refrigerate the paneer for about 1 hour. 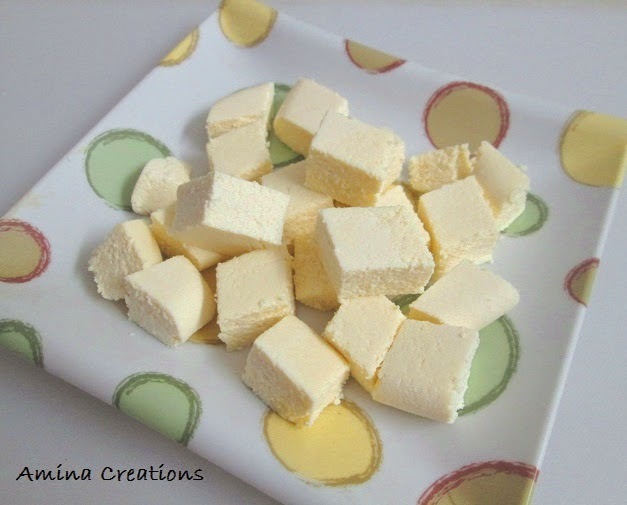 Then carefully remove the muslin cloth, place the paneer on a plate and cut it into cubes or rectangles. You can use it as it is or deep fry or shallow fry in oil till golden brown. Paneer is now ready. Add it to any gravy of your choice. c'est par hasard que j'ai vu ton blog, il est formidable, il n'y a que de bons plats et de la bonne cuisine, je te dit merci. je voudrais être abonnée à ta newletter mais je ne sais comment faire. comment prépare-t-on le massala à la maison.